Sprint Cell Plans - Worth It? Sprint’s cell phone services have excelled lately. They offer 4G service—something that no other U.S. provider yet offers. If you are in the market for a new cheap cell phone plan, Sprint might have everything that you are looking for. 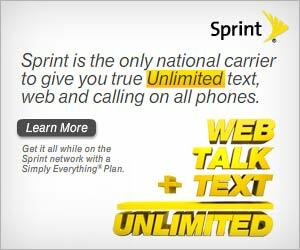 Sprint’s Simply Everything plan includes unlimited talk, text, and web services. For only $99.99 per month, the Simply Everything plan has no true counterpart within other cell phone providers. If you have a family that needs this feature, adding each additional line only costs $89.99 after the primary line. You can have up to a total of five lines within this plan, so you are sure to cover everyone in your family. This plan is worth its cost if you are planning on using your cell phone non-stop, but in reality the vast majority of cell phone users do not need everything. The Everything Data with any Mobile, Anytime plan is a bit more realistic. This only costs $69.99 for the primary line, and gives subscribers unlimited text and web access. This is extremely competitive with other leading cell providers. However, it does need to be mentioned that the downside of this plan is that it only comes with 450 minutes of talking. This makes it a great plan for those using it primarily for texting, but if you need a lot of minutes for talking, this plan is not for you. However, for an additional $20 you can upgrade the Everything Data plan to 900 minutes of speaking. This brings the plan up to $89.99. You can also get more traditional cheap cell plans. These come with 450 or 900 minutes and cost $39.99 and $59.99, respectively. A 700 minute talk only family plan is also available for $69.99 for the primary line, and $9.99 for each additional line, up to a total of five. Any minutes used over the 700 allotted cost $0.45 per minute. Sprint offers a vast number of different phones, but they are most known for their 4G connectivity. As of right now, Sprint is the only carrier that offers 4G service in the U.S. 4G does very little for voice, but when it comes to data plans, this service is unsurpassed. The EVO is Sprint’s top phone because of the 4G service that it provides. This phone processes data about 10 times faster than other smart phones. On top of this, the EVO has a 4.3 inch touch screen, making it extremely easy to use. Sprint also has iDEN technology on many of their phones. This feature is very similar to a walkie talkie and can connect you instantly to another phone simply with the push of a button. Sprint offers GPS services as well as a Family Locator, allowing subscribers to see instantly where their family members are. This includes the ability to look at satellite maps that come complete with street names. This service is only $5.00 per month and can be used on up to four phones. There is also the option of using Sprint Music, Sprint Radio, and Sprint TV. Sprint has about 2 million downloadable songs that you can put onto your phone. You can also listen to the radio commercial-free on a Sprint device. If these things are not enough, you can also get Sprint TV Xtra for an additional $9.99 per month. If you are looking to terminate your contract early, it will cost you $200. This is slightly higher than the competition’s going rates. After five months of owning the service, your cancellation fee will go down by $10 per month to a minimum of $50. There is an activation fee of $36 when beginning service, but this fee is generally waived if you purchase your plan online. There is also a restocking fee of $35 if you trade in your phone within the first 30 days of having the service. Keep in mind there is usually a Sprint Rebate to help you save. Sprint is one of the more competitive cell phone providers. However, they offer a lot of features that go unused by many subscribers. If you truly use your phone for many different features, their cheap cell phone plans are some of the best ones out there. Be sure to take a good look at what features you need before committing to a plan through Sprint because they do have a high early termination fee.